Jake Koffman of Orono throws the discus for Stanford University during the Stanford Track and Field Invitationals last month in Palo Alto, California. The graduation from high school to college is full of transitions. For Orono High School grad Jake Koffman, much of his ascension to life as a freshman at Stanford University involves a sentiment shared by thousands of college freshmen each year. “In terms of academics it’s been pretty smooth,” he said. “I love the freedom of college and the ability to choose pretty much whatever class I want and take it. Koffman’s transition is made more complex by one of the focal points of his high school and college experience — track and field. Koffman was recruited to Stanford during a stellar career at Orono where he became the state record-holder in the discus at 199 feet, 1 inch. He also was a two-time New England champion and three-time state champion in that event and went on to place fourth at the 2017 U.S. junior championships and third at the 2016 New Balance Outdoor Nationals. His transition to classes and competition across the continent in Palo Alto, California, was perhaps simplified by the fact that throwers on the Stanford men’s track team routinely redshirt their freshman indoor seasons. That is done in part to help in the adjustment to college life and also because the weights of the instruments being thrown increase from high school to college. 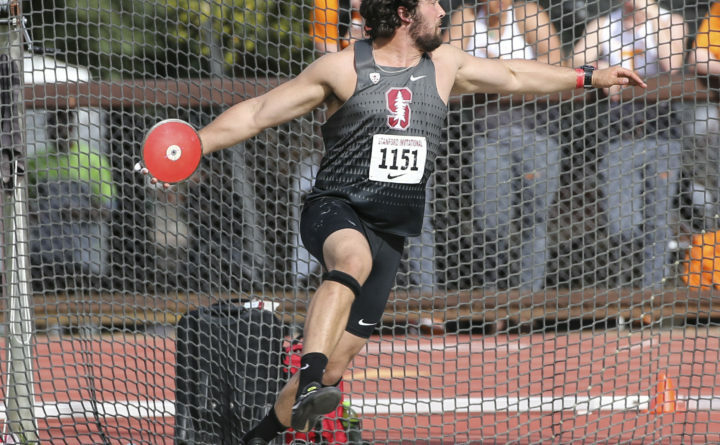 The discus Koffman now throws at Stanford is 2 kilograms or approximately 4½ pounds, compared to 1.6 kilos or approximately 3½ pounds in high school. The college shot put is 16 pounds compared to 12 pounds in high school. Koffman is satisfied with his progress to date in the discus, with his best so far this spring with the new weight at 52.52 meters (approximately 173 feet). “You do have think about form more, but that’s because when the weight is super light you can miss positions and just muscle it out there,” Koffman said. He hopes to top 55 meters in the discus before the end of the outdoor season. Koffman also is gaining an appreciation for the increased level of competition in Division I. Each thrower gets three first-round attempts but only the top nine qualify for three additional throws in the finals. Koffman is one of 14 throwing specialists on the Stanford roster, a peer group with a unique perspective on their shared sporting passion.